Welcome to my Damned DVD trading page.I've been a collector of DVD's of The Damned for many years and have been trading for over 34 years. I'm looking for new DVD-R from The Damned 1976-1995 (Rat Scabies era),Naz Nomad and Phantom Chords or upgrades of stuff I already have. NONE OF THE DISCS ARE FOR SALE,PLEASE DON'T ASK. Jet Boy,Jet Girl/Teenage Dream/Stretcher Case Baby/Ballroom Blitz/Born to Kill/New Rose/Noise Noise Noise/Problem Child/Love Song/Neat Neat Neat/Pretty Vacant/I feel Alright/No Fun. A collection of 32 live & TV performances of The Damned from 1976 - 2002. 2hours 10mins. Featuring Dave Vanian, Rat Scabies & Captain Sensible. curtain call...........wyw 82 just can t be happy..
10th anniversary 86 drinking bout baby..
"Best of The Damned - Volume 2" A collection of rare TV clips. 17. Strawberries Tour 1982 - this *very rare* Japanese documentary film contains interviews with band members, with a live performance on stage of Wait For The Blackout. The film features the legendary 'dancing/singing nuns' ! 21. Stretcher Case Baby - Michael Aspel TV show 1977 - very rare clip ! 25. Blackout -promo - very rare with Rat on vocals !! Total running time: 1Hr 26mins. More TV clips from around the world. 30. 1976 footage of Damned in arcades from Punk decades. 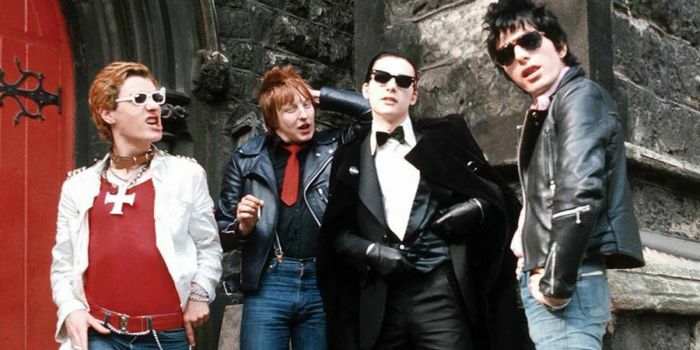 A collection of 32 rare videos/live & TV performances of The Damned. 1976 - 2002. 2hours 10mins. I Fall, Wait For The Blackout, Disco Man, I Just Can't Be Happy Today, Plan 9 Channel 7, Melody Lee, Gun Fury, Noise Noise Noise, Dr Jekyll & Mr Hyde, Billy Bad Breaks, Limit Club, Love Song, Neat Neat Neat, New Rose, Citadel, Looking At You, Smash It Up (pt2). I Fall, Wait For The Blackout, Disco Man, I Just Can't Be Happy Today, Plan 9 Channel 7, Melody Lee, Noise Noise Noise, Dr. Jekyll & Mr Hyde, Limit Club, Love Song, Neat Neat Neat, New Rose. I Fall, Wait For The Blackout, Disco Man, I Just Can't Be Happy Today, Plan 9 Channel 7, Gun Fury, Melody Lee, Noise Noise Noise, Dr Jekyll & Mr Hyde, Limit Club, Love Song, Neat Neat Neat, New Rose, Citadel, Looking At You, Smash It Up. Love Song, Wait For The Blackout, Thanks For The Night, Disco Man, Stranger On The Town, Limit Club, Neat Neat Neat, Noise Noise Noise, Smash It Up, New Rose, Looking At You, Hippy Hippy Shake, Anarchy in the UK, Love Song (reprise), Nasty. Curtain Call, Shadow of Love, Neat Neat Neat, Wait For The Blackout, Grimly Fiendish, Stranger On The Town, Is It A Dream, Limit Club, Smash It Up, I Had Too Much Too Dream (Last Night), Looking At You, Eloise, Street of Dreams, Curtain Call (reprise), Lust For Life, New Rose, I Just Can't Be Happy Today, Love Song, Disco Man, We Love You. Sanctum Sanctorum, Wait For The Blackout, Psychomania, Anything, Shadow of Love, In Dulce Decorum, Lovely Money, Is It A Dream, The Girl Goes Down, Restless, LA Woman, Smash It Up, Eloise, Street Of Dreams. encore 1 - Plan 9 Channel 7, Neat Neat Neat, We Love You. encore 2 - Love Song, Born To Kill. Sanctum Sanctorum, Wait For The Blackout, Psychomania, Anything, Shadow of Love, In Dulce Decorum, Is It A Dream, The Girl Goes Down, Restless, LA Woman, Smash It Up, Eloise, Street of Dreams, Plan 9 Channel 7, Neat Neat Neat. Ignite, Neat Neat Neat, Anything, Stranger On The Town, Is It A Dream, Gun Fury, Shadow Of Love, In Dulce Decorum, Limit Club, Smash It Up. encore - Backdoor Man, LA Woman, Love Song, Tonight, Eloise. See Her Tonite, Neat Neat Neat, Born To Kill, I Fall, Fan Club, Fish, Help, New Rose, I Feel Alright, Smash It Up, I Just Can't Be Happy Today, Wait For The Blackout, Melody Lee, Noise Noise Noise, Love Song, Looking At You, The Last Time. See Her Tonite, Neat Neat Neat, Fish, Help, New Rose, I Feel Alright, I Just Can't Be Happy Today, Noise Noise Noise, Love Song, Smash It Up, Blitzkrieg Bop(with Joey Ramone on vocals), Looking At You, The Last Time. C'mon Everybody, Be Bop A Lula, Bad Motorcycle, Frenzy, You Must Be A Witch, Man Of Mystery, Rumble, one unidentified number, Home of The Blues, Folsom Prison Blues, Fever, One Night With You, Pretty Woman, Cathouse. encore - Wild. See Her Tonite, Noise Noise Noise, You Must Be A Witch, Plan 9 Channel 7, Looking At You, Shadow of Love, Fever, Street of Dreams, Psychomania, Smash It Up, Johnny Remember Me, Cathouse, Love Song. encore - Anything, Tonight, Neat Neat Neat, I Feel Alright. Set 1: See Her Tonite, Fish, Born To Kill, Fan Club, Help, Neat Neat Neat, I Fall, New Rose, I Feel Alright. Set 2: I Just Can't Be Happy Today, Wait For The Blackout, Noise Noise Noise, Melody Lee, Love Song, Smash It Up. encore 1 - Day Tripper, Looking At You. encore 2 - The Last Time. See Her Tonite, I Fall, New Rose, Neat Neat Neat, Fan Club, Fish, Born To Kill, Help, I Feel Alright, Plan 9 Channel 7, Noise Noise Noise, I Just Can't Be Happy Today, Smash It Up, Love Song, Daytripper, Looking At You, The Last Time. See Her Tonite, I Fall, New Rose,Fan Club, Fish, Born To Kill, Help, I Feel Alright, Plan 9 Channel 7, Noise Noise Noise, I Just Can't Be Happy Today. See Her Tonite, I Fall, New Rose, Help, Fan Club, Fish, Born To Kill, Neat Neat Neat, I Feel Alright, Plan 9 Channel 7, Noise Noise Noise, I Just Can't Be Happy Today, Sanity Clause, Smash It Up, Love Song. encore 1 - Daytripper, Looking At You. encore 2 - The Turkey Song, The Last Time. (From the master copy). See Her Tonite, I Fall, New Rose, Help, Fan Club, Fish, Born To Kill, Neat Neat Neat, I Feel Alright, Plan 9 Channel 7, Noise Noise Noise, I Just Can't Be Happy Today, Smash It Up, Love Song, Turkey Song, Daytripper, Looking At You. New Rose, Disco Man, Plan 9 Channel 7, Born To Kill, Help, Wait For The Blackout, Melody Lee, Dr Jekyll & Mr Hyde, Love Song, Looking At You, Curtain Call, Neat Neat Neat. encore 1 - Noise Noise Noise, Smash It Up. encore 2 - I Feel Alright. Soundcheck,New Rose, Disco Man, Plan 9 Channel 7, Born To Kill, Help, Melody Lee, Dr Jekyll & Mr Hyde, Love Song, Looking At You, Curtain Call, Neat Neat Neat, Purple Haze, Noise Noise Noise, Smash It Up, Folsom Prison Blues, I Feel Alright. Curtain Call,Neat Neat Neat,Noise Noise Noise,Smash It Up(Part 1),Smash It Up (Part 2). New Rose, Disco Man, Plan 9 Channel 7, Born To Kill, Help, Wait For The Blackout, Melody Lee, Dr Jekyll & Mr Hyde, Love Song, Looking At You, Curtain Call, Neat Neat Neat, Seagulls, Noise Noise Noise, Smash It Up. Nobody But Me, Action Woman, Kicks, I Had Too Much To Dream (Last Night), I Can't Stand This Love Goodbye, She Lied, Tonight, Down In The Street, Oh Yeah. Testify, Love Song, Disco Man, I Need A Life, Neat Neat Neat, Heaven... Can Take Your Lies, Ignite, Nasty, Shadow To Fall, Never Could Believe, Noise Noise Noise, New Rose, Smash It Up, Looking At You. Testify, Love Song, Disco Man, I Need A Life, Neat Neat Neat, Heaven... Can Take Your Lies, Ignite, Nasty, Shadow To Fall, Never Could Believe, Plan 9 Channel 7, Noise Noise Noise, New Rose, Smash It Up, Looking At You. Testify, Love Song, Disco Man, I Need A Life, Neat Neat Neat, Heaven... Can Take Your Lies, Ignite, Nasty, Shadow To Fall, Never Could Believe, Plan 9 Channel 7, Noise Noise Noise, New Rose, Smash It Up. encore - Looking At You. Testify, Love Song, Disco Man, I Need A Life, Neat Neat Neat, Heaven... Can Take Your Lies, Ignite, Nasty, Shadow To Fall, Never Could Believe, Plan 9 Channel 7, Noise Noise Noise, New Rose, Smash It Up. encore - Curtain Call, Looking At You. Soundcheck, Testify, Love Song, Disco Man, I Need A Life, Neat Neat Neat, Heaven... Can Take Your Lies, Ignite, Nasty, Shadow To Fall, Never Could Believe, Plan 9 Channel 7, Noise Noise Noise, New Rose, Smash It Up, Looking At You. Testify, Love Song, Disco Man, I Need A Life, Neat Neat Neat, Heaven... Can Take Your Lies, Ignite, Nasty, Shadow To Fall, Never Could Believe, Plan 9 Channel 7, Noise Noise Noise, New Rose. encore - Smash It Up. Testify, Love Song, Disco Man, I Need A Life, Neat Neat Neat, Heaven... Can Take Your Lies, Ignite, Nasty, Shadow To Fall, Never Could Believe, Plan 9 Channel 7, Noise Noise Noise, New Rose, I Feel Alright, Smash It Up, Looking At You. Testify, Love Song, Disco Man, I Need A Life, Neat Neat Neat, Heaven... Can Take Your Lives, Ignite, Nasty, Never Could Believe, Gun Fury, Shadow To Fall, Noise Noise Noise, New Rose, Looking At You, Pretty Vacant, My Desire, Smash It Up, I Feel Alright. Testify, Love Song, Disco Man, I Need A Life, Neat Neat Neat, Heaven... Can Take Your Lives, Ignite, Nasty, Never Could Believe, Gun Fury, Shadow To Fall, Noise Noise Noise. Backstage,Testify, Shadow to Fall, New Rose, Looking At You, Not of This Earth, Noise Noise Noise, Disco Man, Running Man, My Desire, Nasty, Gun Fury, Never Could Believe, Neat Neat Neat, I Need A Life, I Feel Alright. encore - Love Song, Smash It Up. Testify, Shadow to Fall, New Rose, Looking At You, Not of This Earth, Noise Noise Noise, Disco Man, Running Man, My Desire, Nasty, Gun Fury, Never Could Believe, Neat Neat Neat, I Need A Life, I Feel Alright. encore - Love Song, Smash It Up. Soundcheck,Testify, New Rose, Shadow To Fall, Looking At You, Not of This Earth, Noise Noise Noise, Disco Man, Running Man, My Desire, Nasty, Gun Fury, Never Could Believe, Neat Neat Neat, I Need A Life, I Feel Alright. encore - Love Song, Smash It Up. Soundcheck,Testify, New Rose, Shadow To Fall, Looking At You, Not Of This Earth, Noise Noise Noise, Disco Man, Running Man, My Desire, Nasty, Gun Fury, Tailspin, Neat Neat Neat, I Need A Life, I Feel Alright. encore 1 - Love Song, Smash It Up. encore 2 - Ignite. Testify, New Rose, Shadow To Fall, Looking At You, Not Of This Earth, Noise Noise Noise, Disco Man, Running Man, My Desire, Nasty, Gun Fury, Tailspin, Neat Neat Neat, I Need A Life, I Feel Alright. encore - Love Song, Smash It Up. Testify, New Rose, Not of This Earth, Looking At You, Tailspin, Noise Noise Noise, Disco Man, Running Man, My Desire, Nasty, Gun Fury, Neat Neat Neat, I Need A Life, Love Song. encore - Ignite, Smash It Up. Testify, New Rose, Not of This Earth, Looking At You, Tailspin, Noise Noise Noise, Disco Man, Running Man, My Desire, Nasty, Gun Fury, Neat Neat Neat, I Need A Life, Love Song. Testify, New Rose, Looking At You, Not of this Earth, Noise Noise Noise, Disco Man, My Desire, Nasty, Gun Fury, Tailspin, Running Man, Neat Neat Neat, I Need A Life, Love Song. encore 1 - I Feel Alright, Smash It Up. encore 2 - Shadow to Fall, Wait For The Blackout. Testify, New Rose, Looking At You, Not of This Earth, Noise Noise Noise, Disco Man, My Desire, Nasty, Gun Fury, Running Man, Tailspin, Neat Neat Neat, I Need A Life, Love Song. encore - I Feel Alright, Smash It Up. Testify, New Rose, Looking At You, Not of This Earth, Noise Noise Noise, Disco Man, My Desire, Nasty, Gun Fury, Running Man, Tailspin, Neat Neat Neat, I Need A Life, Love Song, I Feel Alright, Smash It Up. Testify, New Rose, Not of This Earth, Looking At You (cuts) Tailspin, Noise Noise Noise, Disco Man, Running Man, My Desire, Nasty, Gun Fury, Never Could Believe, Neat Neat Neat, I Need A Life, Love Song. encore - I Feel Alright, Smash It Up. Testify, New Rose, Not of This Earth, Looking At You, Tailspin, Noise Noise Noise, Disco Man, Running Man, My Desire, Nasty, Gun Fury, Never Could Believe, Neat Neat Neat, I Need A Life, Love Song. encore - I Feel Alright, Smash It Up. Soundcheck,Testify, New Rose, Not of This Earth, Looking At You, Tailspin, Noise Noise Noise, Disco Man, Running Man, My Desire, Nasty, Gun Fury, Never Could Believe, Neat Neat Neat, I Need A Life, Love Song. encore 1 - Ignite, Smash It Up. encore 2 - Wait For The Blackout, I Feel Alright. Soundcheck,Testify, New Rose, Not of This Earth, Looking At You, Tailspin, Noise Noise Noise, Disco Man, Running Man, My Desire, Nasty, Gun Fury, Never Could Believe, Neat Neat Neat, I Need A Life, Love Song, I Feel Alright, Smash It Up. Testify, New Rose, Not of This Earth, Looking At You, Tailspin, Noise Noise Noise, My Desire, Disco Man, Nasty, Gun Fury, Shadow To Fall, Never Could Believe, Neat Neat Neat, I Need A Life, Love Song, Wait For The Blackout, Smash It Up, I Feel Alright. I Feel Alright, Testify, New Rose, Looking At You, My Desire, Noise Noise Noise, Tailspin, Disco Man, Gun Fury, Nasty, Shadow To Fall, Never Could Believe, Neat Neat Neat, I Need A Life, Love Song. encore 1 - Ignite, Smash It Up. encore 2 - Pretty Vacant. I Feel Alright, New Rose, Not Of This Earth, Noise Noise Noise, Tailspin, Looking At You, Running Man, Nasty, Rock and Roll, My Desire, Disco Man, Gun Fury, Never Could Believe, Neat Neat Neat, I Need A Life, Love Song. encore 1 - Ignite, Smash It Up. encore 2 - Pretty Vacant, Wait For The Blackout. Soundcheck,Testify, New Rose, Looking At You, Not of This Earth, Noise Noise Noise, Heaven... Can Take Your Lies, Disco Man, Never Could Believe, My Desire, Nasty, Gun Fury, Tailspin, Running Man, Neat Neat Neat, I Need A Life, Love Song. encore - I Feel Alright, Smash It Up. Testify, New Rose, Looking At You, Not of This Earth, Noise Noise Noise, Heaven... Can Take Your Lies, Disco Man, Never Could Believe, My Desire, Nasty, Running Man, Gun Fury, Tailspin, Neat Neat Neat, I Need A Life, Love Song. encore - Gimme Some Lovin', I Feel Alright, Smash It Up. Ignite, New Rose, Testify, Looking At You, Not Of This Earth, Noise Noise Noise, Heaven... Can Take Your Lies, Disco Man, Never Could Believe, My Desire, Nasty, Running Man, Gun Fury, Tailspin, Neat Neat Neat, I Need A Life, Love Song.encore - Green Onions / Time is Tight medley, I Feel Alright, Smash It Up. Ignite, New Rose, Testify, Looking At You, Not of This Earth, Noise Noise Noise, Heaven... Can Take Your Lies, Disco Man, Never Could Believe, My Desire, Nasty, Running Man, Gun Fury, Tailspin, Neat Neat Neat, I Need A Life, Love Song, Hawaii 5-O, I Feel Alright, Smash It Up. Ignite, New Rose, Testify, Looking At You, Not Of This Earth, Plan 9 Channel 7, Noise Noise Noise, Heaven... Can Take Your Lies, Disco Man, Never Could Believe, My Desire, Nasty, Running Man, Gun Fury, Tailspin, Neat Neat Neat, I Need A Life, Love Song, Curtain Call, I Feel Alright, Smash It Up. Ignite, New Rose, Testify, Looking At You, Not Of This Earth, Plan 9 Channel 7, Noise Noise Noise, Heaven... Can Take Your Lies, Disco Man, Never Could Believe, My Desire, Nasty, Running Man, Gun Fury, Tailspin, Neat Neat Neat, I Need A Life, Love Song. encore - Curtain Call, Smash It Up. Ignite, New Rose, Testify, I Just Can't Be Happy Today, Not Of This Earth, Plan 9 Channel 7, Noise Noise Noise, Heaven... Can Take Your Lies, Disco Man, Never Could Believe, My Desire, Running Man, Looking At You, Gun Fury, Tailspin, Neat Neat Neat, I Need A Life, Love Song. encore - Curtain Call, Smash It Up. Ignite, New Rose, Testify, I Just Can't Be Happy Today, Not Of This Earth, Plan 9 Channel 7, Noise Noise Noise, Heaven... Can Take Your Lies, Disco Man, Never Could Believe, My Desire, Running Man, Looking At You, Gun Fury, Tailspin, Neat Neat Neat, I Need A Life, Love Song. encore - Curtain Call, I Feel Alright, Smash It Up. Ignite, New Rose, Testify, I Just Can't Be Happy Today, Not Of This Earth, Plan 9 Channel 7, Noise Noise Noise, Heaven... Can Take Your Lies, Disco Man, Never Could Believe, My Desire, Running Man, Looking At You, Gun Fury, Tailspin, Neat Neat Neat, I Need A Life, Love Song. encore 1 - Curtain Call, Smash It Up. encore 2 - Pretty Vacant, I Feel Alright. See her Tonite,Neat Neat Neat,Born to Kill,I Fall,New Rose,I Feel Alright,I Just can’t be Happy Today,Wait for the Blackout,Melody Lee,Lookin’ at you,The Last Time. Nobody But Me, Action Woman, I Had Too Much To Dream (Last Night), Looking At You, I Can't Stand This Love Goodbye, Riders On The Storm. Nervous Breakdown, I Can't Stand This Love Goodbye, Frenzy, Action Woman, Bad Motorcycle, Oh Yeah, Runaway Boys, She Lied, King Creole, You Must Be A Witch, Kicks, I Can Only Give You Everything, Don't Do It Some More, Fever, Be Bop A Lula, My Girl Is Red Hot, Cathouse, LA Woman, Backdoor Man. Voodoo Doll, This House Is Haunted, Town Without Pity, Chase The Wild Wind, Screamin Kid, Jezebel, Piece of My Heart, Tonight We Ride, Haunted Garage, You And I, Born To Be Wicked, After The Lights Go Out, The Loveless And The Damned, Bad Motorcycle, Fever. encore - One Night, Mystery Train. Soundcheck:Voodoo Doll, Screamin Kid, Piece Of My Heart, Town Without Pity, Born To Be Wicked, Chase The Wild Wind, Jezebel, This House Is Haunted, You And I, Fever In My Blood, Gunning For Love, Shadow Of Love, Fever. encore 1 - Someone Up There, The Loveless And The Damned. Voodoo Doll, Screamin Kid, Piece of My Heart, Town Without Pity, Born To Be Wicked, Chase The Wild Wind, This House Is Haunted, Jezebel, You And I, Fever In My Blood, Gunning For Love, Shadow of Love, Fever. encore - Beat Girl, Someone Up There, Bad Motorcycle.